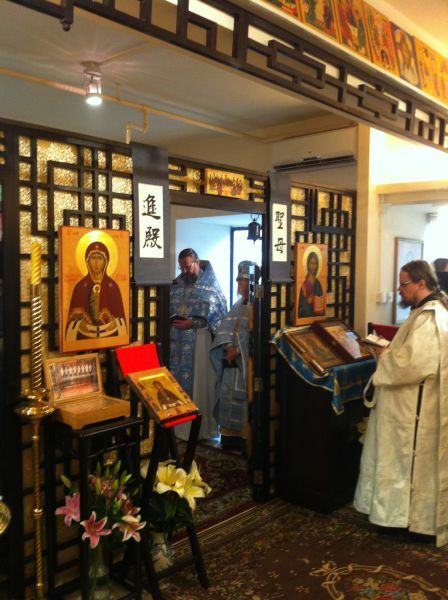 Friday December 7, 2012 was the second day where special events were held commemorating 300 years of the Russian Orthodox Mission in China. Early in the morning, the hierarchical Divine Liturgy at SS Peter & Paul parish in Hong Kong was presided by Bishop Ephraim of Bikin, Provost of Khabarovsk Theological Seminary. Concelebrating with His Grace were the parish rector Fr Dionisy Pozdnyaev, Father Michael Li from Australia, Fr Vladimir Boikov from New Zealand, Fr Alexy Kiselevich from Shanghai, Fr. 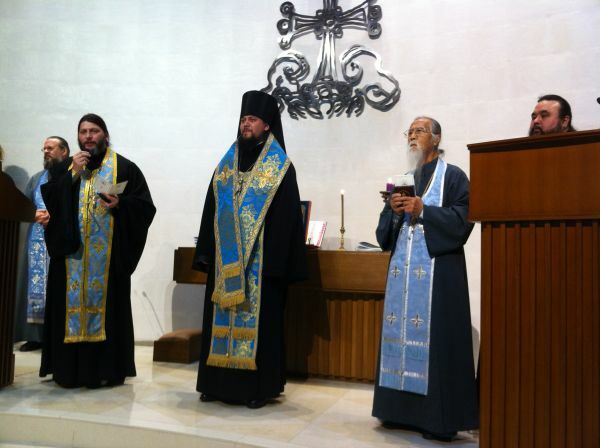 Cyrill Shkarboul from Taipei, and Fr Deacon Georgy Maximoff from the Missionary Foundation of St. Serapion in Moscow. Subdeacon Papiy Fu read the Third Hour in Chinese followed by the reading of the Sixth Hour in English by Mitrophan Chin of the Orthodox Fellowship of All Saints of China. At the conclusion of the Liturgy, Bishop Ephraim presented the parish with a new censer and Fr Dionisy presented His Grace with several gifts. As the parishioners came forward to receive Vladika’s blessing, each were given a blessed icon print of the “Khabarovsk” Icon of the Mother of God. In the afternoon, the clergy led the Thanksgiving Prayer Service (Moleben) at the Chinese University of Hong Kong. The responses were sung by parishioners and special guests including Subdeacon Papiy Fu in Chinese. An award ceremony was held afterwards, where individuals were introduced by Fr Dionisy Pozdnyaev and presented with a commemorative medallion by Bishop Ephraim for their contributions to Orthodoxy in China in their area of expertise. Then they made their way to the Orthodox book fair which was already attracting the attention of students on campus. A press conference was arranged by Daniel Leung of the Institute of Sino-Christian Studies, whereby local media were given an opportunity to hear and respond to the current situation relating to the Orthodox Church in China. The media also inquire about differences between Orthodoxy and other Christian confessions including such questions as why the use of leaven bread for Holy Communion in the Orthodox Church while the Catholics and Protestants use unleaven bread. At the conclusion of the press conference, a round table discussion concerning the Russian-Chinese lexicon was held between the mainland Chinese scholars and Russian Orthodox sinologists. The Chinese scholars presented their requirement of terminology suitable for academic use for Sino-Christian studies, while the Orthodox sinologists presented their requirement of terminology suitable for missionary, theological and liturgical church use. Daniel Leung moderated the discussions to identify next actions to meet the needs of both sides. The majority of the clergy and those not involved with the lexicon discussion went to the Hong Kong cemetery to offer memorial prayers for the departed Orthodox servants of God. The majority of the departed Orthodox buried there were parishioners of the original SS Peter & Paul Church in Hong Kong. In the evening, the Orthodox Brotherhood of Saints Apostles Peter and Paul hosted a buffet dinner at the Hong Kong Renaissance Harbor View Hotel. Accomodating the guests with a wide selection of lenten Asian dishes, the atmosphere was filled impromptu speeches and singing characteristic of warm Orthodox fellowship.